18 • RV PRO • March 2019 rv-pro.com S P E C I A L S E C T I O N – R V X P R E V I E W W hat's new and different about the upcoming RVX: The RV Experience show in March? 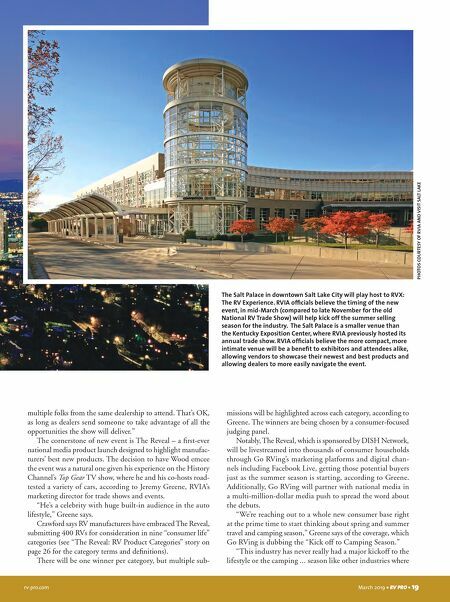 In a word: Plenty, according to Liz Crawford, senior vice president of trade shows and events for the RV Industry Association. Just a sampling: A fast-paced product reveal event with the stylings of an automotive show that's being emceed by TV celebrity Rutledge Wood of Top Gear fame, the debut of a proprietary web-based sales toolkit specifically designed to help dealers tap into a new base of consumers, an "amped up" Top Tech Challenge, and an all-new robust educational platform that includes sought-after training from Sobel University and the RV Dealers Association RV Learning Center. "This will be unlike any event the industry has ever seen before," Crawford says of RVX, scheduled for March 12-14 at the Salt Palace in Salt Lake City. 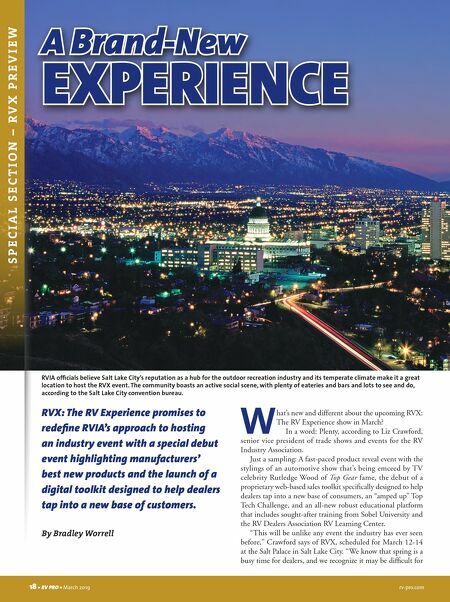 "We know that spring is a busy time for dealers, and we recognize it may be difficult for RVX: The RV Experience promises to redefine RVIA's approach to hosting an industry event with a special debut event highlighting manufacturers' best new products and the launch of a digital toolkit designed to help dealers tap into a new base of customers. By Bradley Worrell A Brand-New EXPERIENCE RVIA officials believe Salt Lake City's reputation as a hub for the outdoor recreation industry and its temperate climate make it a great location to host the RVX event. The community boasts an active social scene, with plenty of eateries and bars and lots to see and do, according to the Salt Lake City convention bureau.